Description: [o-lee-veh dih kas-tel-veh-TRAH-noh] From the Sicilian region of Italy, our most popular olive, large and bright green with lots of meat on the pit. 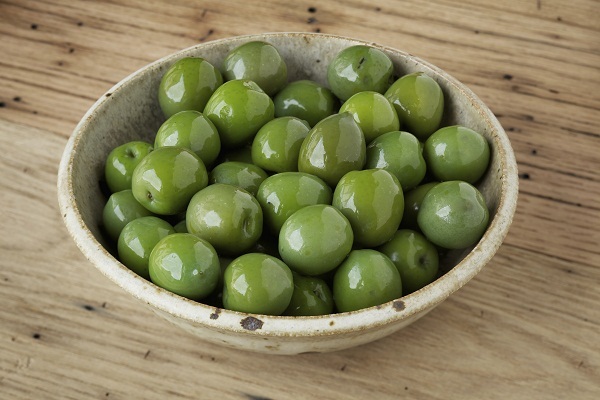 Olive di Castelvetrano are mild in flavor with a slightly saline and non-bitter aftertaste…usually people who don’t like olives, love these. As with all olives, delicious served with all table cheeses, salamis, and especially buffalo mozzarella. The Castelvetrano is grown exclusively in western Sicily among the Belice river valley, near the town of Castelvetrano. Late to fruition and bearing fruit in its fifth year, the tree’s average yield is fair with crops typically alternating. Harvest for table olive purposes begins the first week of October and extends through until the middle of November. The processed Castelvetrano olive must be either refrigerated or canned, otherwise it will turn quickly. This is because the olive doesn’t undergo the fermentation process. The use of chlorophyl dye is prohibited by USDA standards. It can be inferred that the olive is most likely treated with this dye if left out of refrigeration to keep its bright neon green color instead of oxidizing to a dark greenish-brown.